You can see for yourself if you watch the video below, which I recommend, especially to anyone prejudiced into a negative opinion about the Atlanta occupation’s impoliteness. You may draw the same conclusion, but it’s important to be accurate about what really happened there: An agenda had been previously agreed to, Lewis was requesting to interrupt it, and, according to the agreed upon Assembly rules, changing the agenda required “consensus,” which the Assembly was unable to reach.Therefore, the previously agreed to agenda remained in effect and Lewis was unable to interrupt. Lewis himself humbly accepted the Assembly’s decision. In the official American democracy, the “facilitator” would be called “president” and would be given superordinate power to overrule the nonconsensus default to the previously agreed upon agenda. The president could very well rule on the side of the “polite” and allow Lewis to speak. Perhaps there would be no harm in such a democracy’s favoring of individual power over the governed. The crowd would have the benefit of Lewis’s experience as a leading civil rights activist and longtime member of Congress and the Congressional Black Caucus. Rep. Lewis would have been accorded the respect many agree (including the “block” who initiated Lewis’s exclusion) he deserves. But the Assemblies of the occupation are experimenting with an unfamiliar, self-creatively direct form of democracy, in which the governed are at the very same time the governors. The American Constitution presumes the consent of the governed in its creation of a representational form of democracy, i.e., one in which the people yield their involvement in the making of laws that govern them to elected officials, who make their decisions allegedly on their constituents’ behalf. We know how this form of “consent” can go far, far astray, particularly when money and other distinctions among the people are permitted to influence our elected officials. But the occupation’s General Assemblies insist on immediate, real and active consent of the governed. There is no delegation of responsibility to characters we never meet who depend on raising cash to earn our votes. Imagine if the American people were given a direct say in whether or not to end the Bush-era tax breaks for the super rich. Would the Congress be able to utterly ignore, as it is now, the consensus that polling shows the people have formed in favor of such a measure? The conservative buffoons who made the video to embarrass the occupation actually provided it the major service, despite their worst intentions, of recording its direct democracy in action. I think it’s thrilling to watch, and the high stakes Lewis’s presence brings to the decision only adds to the inherent drama. This entry was posted in Democracy, Politics and tagged #occupyAtlanta, #OccupyWallStreet, Civil Rights, Congress, Constitution, direct democracy, government, John Lewis, representative democracy, revolution, taxes. Bookmark the permalink. Rep. Lewis was a total mensch about this event. I wonder, though, if the process adopted by the assembly has any path in it that would lead to a future opportunity for John Lewis to address the crowd. Clearly, yes. He can either be invited by someone in the assembly who can put his appearance up for a vote, or he can request a time to speak and the assembly can put it up for a vote. 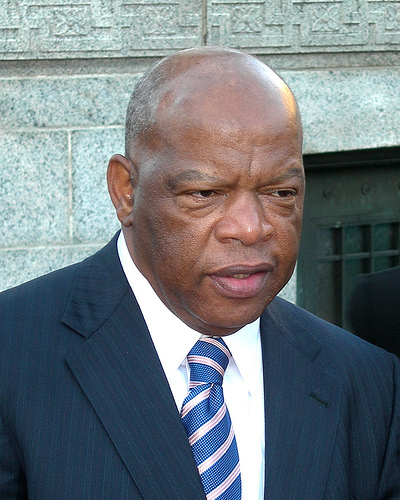 I’m sure that John Lewis being who he is to America and Atlanta would easily win a spot to address the assembly. You must mean who John Lewis was. John Lewis today is a Congressman who sits silently while Obama the Bomber continues Bushes wars and starts new ones like in Libya. Lewis sits silently while Obama the Bomber asserts a right to designate, in secret, individuals and groups as terrorist, and a right to murder them. Lewis sat silently after Obama the Bomber watched the capture of an unarmed ben Laden and had him murdered and his body dumped in the ocean. Lewis sat and sits silently after Obama the Bomber had murdered two young men who were U.S. citizens, mainly for their big mouths since neither of them had picked up any weapon except their constitutionally protected speech. First Amendment? No more. Murdered by Obama the Bomber. Under the Nuremberg Edicts this entire government, save those who speak up and act in opposition, are complicit in war crimes. Lewis is therefore, due to his silence, aiding and abetting the murder and terrorist Obama the Bomber in those war crimes and murders, thus a criminal himself. What we ought to do, since occupation asserts a state authority, is indict Lewis for aiding and abetting in war crimes and murder.